Home / Designer / designers / Fashion / Sheria Ngowi / Tanzania Designer / Vote / MPIGIE KURA SHERIA NGOWI, NOMINATED FOR THE AFRICAN YOUTH CHOICE AWARD IN THE CATEGORY OF AFRICAN YOUTH ENTREPRENEUR OF THE YEAR 2016. MPIGIE KURA SHERIA NGOWI, NOMINATED FOR THE AFRICAN YOUTH CHOICE AWARD IN THE CATEGORY OF AFRICAN YOUTH ENTREPRENEUR OF THE YEAR 2016. 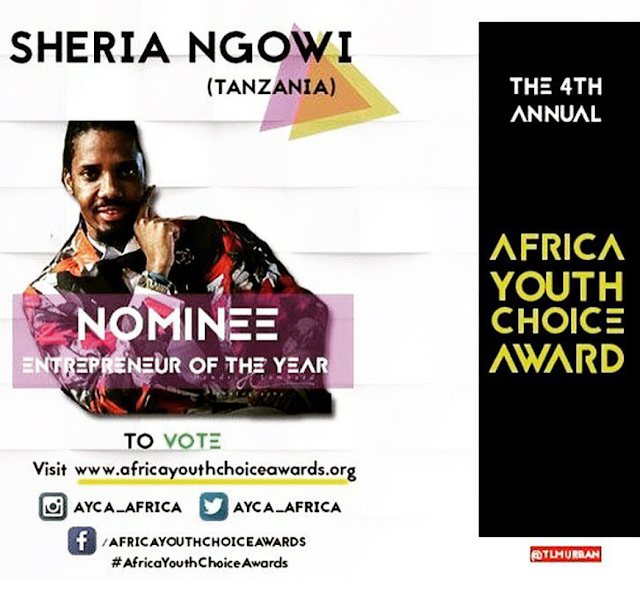 SHERIA NGOWI -TANZANIA NOMINATED FOR THE AFRICAN YOUTH CHOICE AWARD IN THE CATEGORY OF AFRICAN YOUTH ENTREPRENEUR OF THE YEAR 2016. The 2016 African Youth Choice Award which will take place on Saturday September 17th 2016,Nigeria. UNAWEZA KUPIGA KURA MARA MOJAVE KILA BAADA YA LISAA. .CLICK THE LINK ABOVE NA ITAKUPELEKA MOJA KWA MOJA KWENYE PAGE AMBAYO UNAWEZA KU-VOTE.